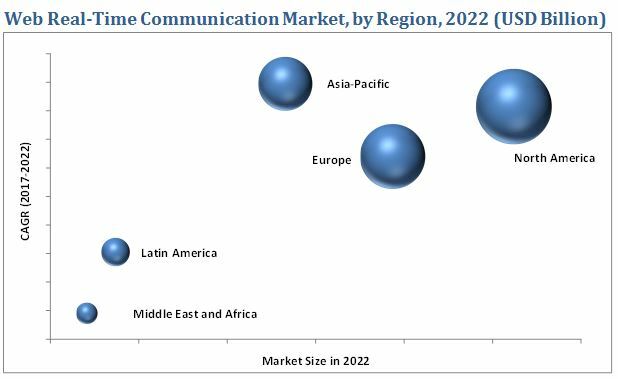 [134 Pages Report] The Web Real-Time Communication market is projected to grow from an estimated USD 1.04 Billion in 2017 to USD 6.49 Billion by 2022, at a Compound Annual Growth Rate (CAGR) of 44.2% during 2017–2022. The base year considered in the report is 2016. The WebRTC ecosystem includes technology vendors such as TokBox, Inc. (U.S.), Apidaze (France), AT&T (U.S.), Avaya, Inc. (U.S.), Cisco Systems, Inc. (U.S.), GENBAND Inc. (U.S.), Dialogic, Inc. (U.S.), Polycom, Inc. (U.S.), Oracle (U.S.), Twilio, Inc. (U.S.), Quobis (Spain), and Cafex Communications, Inc. (U.S.), among others, which provide various IT and non-IT components required in the Web Real Time Communication Market. These Web Real-Time Communication Solutions Vendors are rated and listed by us on the basis of product quality, reliability, and their business strategy. Please visit 360Quadrants to see the vendor listing of Web Real-Time Communication Solutions. The Web Real-Time Communication market is projected to grow from an estimated USD 1.04 Billion in 2017 to USD 6.49 Billion by 2022, at a Compound Annual Growth Rate (CAGR) of 44.2% during the period 2017–2022. The major drivers in the Web Real Time Communication Market include webification of communication, increasing demand for WebRTC solutions from SMBs, and demand for secure & robust communication. The scope of this report covers the Web Real Time Communication Market by product type, vertical, and region. The services segment is expected to grow at the highest CAGR during the forecast period. Service providers help in implementing WebRTC solutions for the efficient operation and maintenance of any enterprise. The video calling and conference solution is expected to grow at the highest CAGR during the forecast period. The video calling & conferencing solution helps develop overall business efficiency, delivering a unified and improved communications experience. The healthcare segment is expected to grow at the highest CAGR during the forecast period. The landscape of the industry has changed over the past few years, majorly driven by changes in consumer/patient demands and digitalization. This brings in the need for channelized data insights, improved communication, improved data quality, and accurate clinical information consolidated through the deployment of WebRTC solutions. 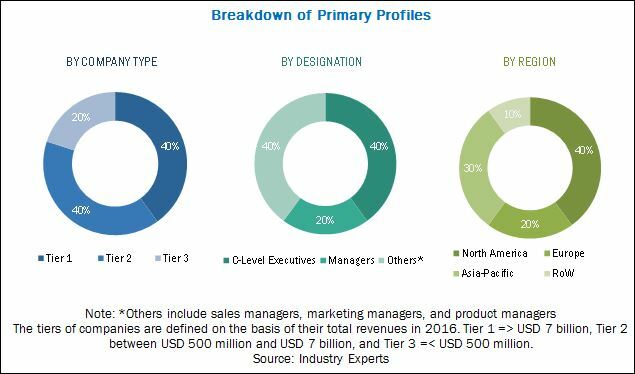 The Web Real-Time Communication market in the Asia-Pacific is expected to grow at the highest CAGR and also hold the highest market share during the forecast period due to the high internet connectivity, mobile workforce expansion, and increasing adoption of mobile devices. Large enterprises as well as small & medium-sized businesses in the Asia-Pacific countries have begun to acknowledge the importance of WebRTC solutions, and are focusing on the deployment of dedicated WebRTC solutions to facilitate affordable real-time communication and to efficiently serve customer requirements. WebRTC standards are still in the development phase, which is the restraining factor that is expected to affect the growth of the Web Real-Time Communication Market. WebRTC solution vendors profiled in the report include TokBox, Inc. (U.S.), Apidaze (France), AT&T (U.S.), Avaya, Inc. (U.S.), Cisco Systems, Inc. (U.S.), GENBAND Inc. (U.S.), Dialogic, Inc. (U.S.), Polycom, Inc. (U.S.), Oracle (U.S.), Twilio, Inc. (U.S.), Quobis (Spain), and Cafex Communications, Inc. (U.S.). *Business Overview, Product Offerings, Business Strategies, Recent Developments, Key Relationships Might Not Be Captured in Case of Unlisted Companies. 11.2 Huawei Technologies Co. Ltd.
11.5 Temasys Communications Pte Ltd.